Thank you for taking care of us! – Let's Talk About It, Lewis! When I’m at a big luncheon or similar situation, I find myself watching the faces and demeanor of the servers. I can’t remember when I started doing this, but it was a long time ago. Perhaps it was after reading William F. Buckley’s An Attitude of Gratitude. It is more likely that it’s part of my DNA since my parents had that nature. I find myself having a need to thank the servers in a genuine tone and then seeking them out afterward to thank them again. What I don’t know is whether I do this for the server or for me. It could easily be me doing the serving. My blue-collar upbringing, then college, and then my wife have shaped my every step. Mentors have opened doors, and a few pushed me through those passageways. A colleague of mine, Ron Holifield, has been placing a big emphasis on Servant Leadership. My first introduction to that particular topic came years ago from another good friend and colleague, Dan Johnson. In a leadership course, he talked about Robert Greenleaf who coined the term. Greenleaf got his idea after reading a book by Hermann Hesse who authored a book about a journey. The story was about a group of people on a long pilgrimage to seek a great master. The storyteller is laboring with his baggage on the journey when a small man comes to his aid, picking up some of his bags and carrying the load. At some point near the end of the journey the helper disappears, which irritates the pilgrim. Soon after they all reach the top of the mountain. When they meet the master, the man is surprised to learn that it was the master himself who appeared and carried his burden. These kinds of stories fascinate me. And motivate me. I’ve got many. About 3 out of 4 times my wife Linda goes grocery shopping, half of her time is spent shopping. The other half is spent seeking out a person who needs help. One of her best friendships today started at Wal-Mart years ago with a simple comment turned into an hour-long conversation. And that was just the beginning. I don’t know if they still do this, but under Ron Whitehead’s leadership at Addison, the councilmembers and CMO staff used to host a cookout for all city staff. A simple gesture with a profound impact. So, today comes another story. It started my day with an early lift, like a devotional to ground me and to infuse me with gratitude. I’ll let it speak for itself. 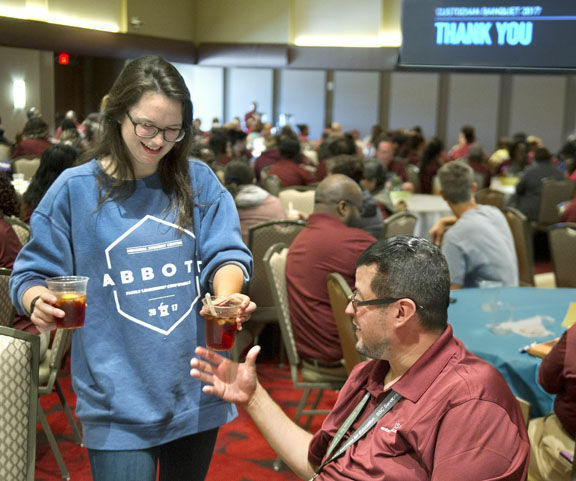 Texas A&M student Tess Volanski hands a cold ice tea to A&M custodial worker Eliseo DelaGarza during an appreciation banquet Monday in the Bethancourt Ballroom at the MSC. For nearly 20 years, Roslyn Adams has served the students, faculty and staff of Texas A&M University as a member of the custodial team, but Monday — even if for just a few hours — she and her peers got to take a break and enjoy each other’s company in the Bethancourt Ballroom of the Memorial Student Center. More than 500 members of the university’s custodial staff, employed by custodial, grounds and maintenance service provider SSC, were honored during the annual Custodian Banquet, which featured a catered lunch, raffle, music and a photo booth. Adams said the student-organized event is a meaningful gesture from those she and her co-workers serve on a daily basis. Freshman Madeleine Williams, a member of the Student Government Association’s Custodian Banquet committee, said helping to plan the event has been special to her as she has been able to interact with custodians throughout the year. After nearly seven months of preparation and fundraising, Williams said, it was rewarding to see the custodians enjoying the event. In addition to helping serve the food, busing the tables and visiting with the staff, the students were also in charge of cleaning up the space once the event was over. Brandon Placker, who has worked at the university for roughly seven years, said while many of the people he comes into contact with on a daily basis are kind, the nature of their work remains largely thankless. Placker said he is appreciative of the students’ efforts to show their gratitude. “To know that people actually care, it means a lot,” Placker said. Sincere Johnson, who has been on the job just over 10 months, said she particularly appreciated the free, on-the-clock lunch. “They saved us money today [since] we didn’t have to go buy lunch, and it was nice to see all the other people I’ve worked with before,” Johnson said. Ted Dawson, regional manager for SSC, said with more than 23,000 square feet of facilities, it is a rarity for all of the employees to get together. Is McKinney Sandbagging Revenue Estimates?